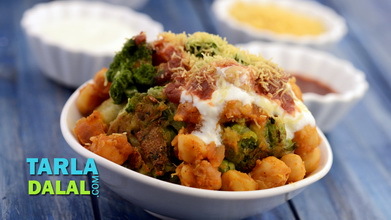 Another street side chaat which is so simple to make but yet so delicious. 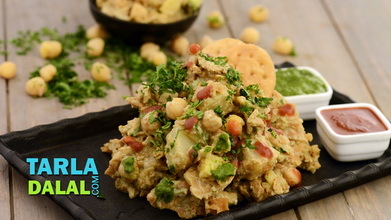 It is a delectable blend of green chana, tomatoes, onions tossed in butter, spiked with a little chaat masala. 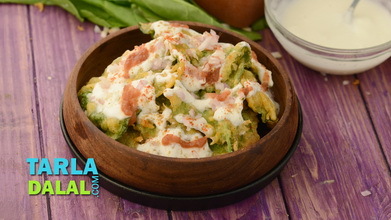 Baked papadis added on top lend crunch to this recipe without adding on too many calories. 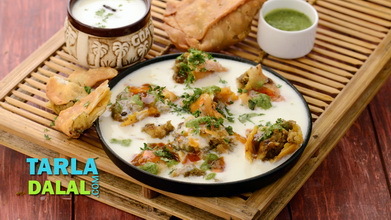 Stir up this chaat any time in the evening and your family will love it. But remember to make it fresh and serve it hot! 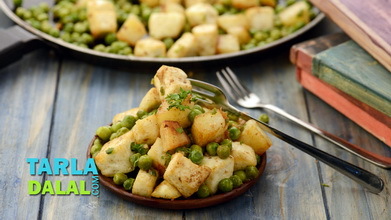 Heat the butter in a non-stick pan, add the hara chana, mix well and sauté on a medium flame for 1 minute. 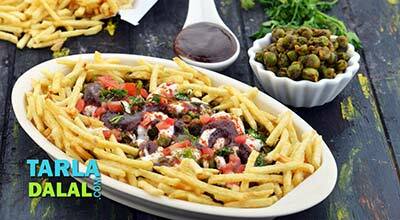 Add the salt and chaat masala, mix well and sauté on a medium flame for 1 minute. 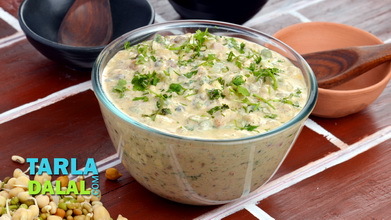 Add the coriander and green chillies, mix well and cook on a medium flame for 4 to 5 minutes, while stirring occasionally. 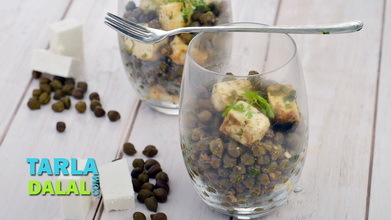 For serving, place a portion of the chana in a serving bowl, top it with 2 tbsp coriander, 1 tbsp onion, 1 tbsp tomatoes, ½ tsp green chillies, ½ tsp lemon juice, 1 tbsp sev , 1 tbsp crushed papdis and a pinch of black salt and toss well. Repeat with the remaining ingredients to make 3 more servings.